Brenda Kesi (Arire) has created an ancestral sihoti'e taliobame'e (design of the mud) known as wo'ohohe representing the ground-burrwing spider, just as she was taught by her mother, Go'ovino. THis design can be traced to the old Emate clanvillage of Enope which was abonded due to the 1951 eruption of Huvaimo (Mount Lamington). Brenda recalls how in the lod days of making barkcloths the women had nopaints so they would soak the barkcloth in mud, cut the desired pieces and then sew them onto the plain barkcloth. The contrasting effects would result in various bold visual designs. The design was sewn with a bat-winged bone needle and a river reed was shreeded to create the sewing thread. The Omie creation story tells of how the very first sihoti'e nioge (mud-dyed barkcloth) was created by Suja the first Omie woman and mother of the world, under instruction from Mina, the first Omie man, after she experienced her first menstruation. Suja dyed the plain barkcloth in the volcanic clay at the river Uhojo at the base of sacred Mount Obo. 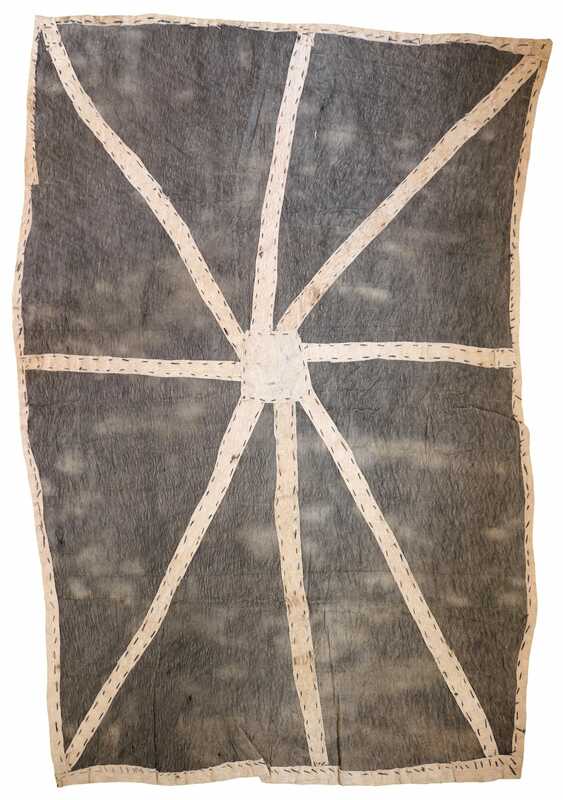 Suja wore the mud dyed barkcloth during her menstruation and lived in seclusion in a small hut know as je'o jarwe (also called ivi'ino'ove'tove) for its duration.